February 7, 2019 (KHARTOUM) - Former Press Secretary of South Sudan’s main opposition leader, Riek Machar, said he has forgiven those responsible for his kidnapping from the Kenyan capital, Nairobi, in 2016. James Gatdet Dak also said he was grateful for his freedom after South Sudanese President, Salva Kiir, ordered for his immediate release from prison in accordance with a peace deal he signed with opposition groups in the country. In a statement to Sudan Tribune from the Sudanese capital, Khartoum, on Wednesday, Dak congratulated President Kiir and SPLM-IO’s leader, Machar, on reaching the peace deal. "I want to leave behind whatever had happened to me. 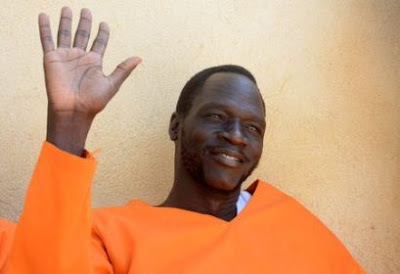 I have forgiven those responsible for my kidnapping and illegal deportation from Nairobi to Juba, " Dak told Sudan Tribune. Dak, a registered refugee in Kenya, was kidnapped from his home in Nairobi on 2 November, a move widely condemned by UN and human rights bodies around the world. He said he was later on informed that he was arrested by Kenyan security officers for expressing support to the dismissal of a Kenyan UN force commander in South Sudan who was accused of failing to protect civilians during July 2016 crisis in Juba. The opposition leader’s former spokesman was deported to Juba on 3 November 2016 and he was immediately arrested by South Sudanese national security officers upon his arrival at Juba airport. He was detained and sentenced to death for working against the government of President Kiir. Dak said the court verdict was a political decision, which President Kiir also reversed politically by pardoning him during a peace celebration attended by Machar. Despite his suffering in detention and prison for two years, Dak said he wanted to open a new page of forgiveness and reconciliation in his heart. "I don’t want to hold grudges against anyone. I want to reconcile with those who targetted me and made me suffer," he said, adding that his work as a press secretary in the SPLM-IO was wrongly taken personally by some. Dak also expressed his gratitude to IGAD countries, particularly Sudan and Ethiopia for successfully mediating the warring parties to stop the war. He encouraged the opposing political leadership in the country to implement the signed revitalized peace agreement in letter and spirit. "The people of South Sudan need peace. They need basic services. There should be no return to war again, " he concluded.